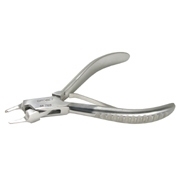 Post & End Piece Pliers For Rimless & Pince-Nez Eyeglasses | QTE North America, Inc. | QTE North America, Inc.
Post and end-piece pliers with thin notched jaws for added control while bending metal frames. Originally designed for use on antique pince-nez frames. Designed so that jaws are parallel at the front when opened to 2mm, and parallel at the back when opened to 4mm.